It was an exceptionally busy Festival of Smalls opening, with tonnes of little works finding new homes. Curious to see examples of smalls groupings in private spaces, I asked our fabulous web designer, and client, Steven Ishiwara to send us a picture of his recent acquisitions. 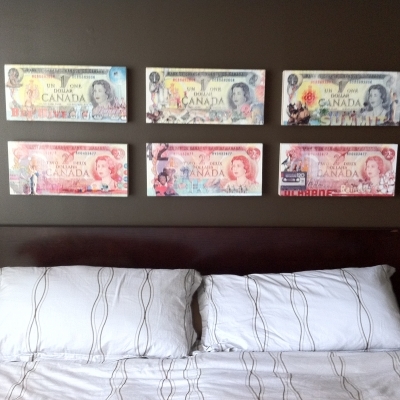 In their bedroom, Steven and Brad grouped six of Greg Shegler's bold dollar bill works, creating a dramatic wall in a minimal space.